100% brand new and high quality case. Enough room for projector and the accessories. Double zipper design for the main compartment, convenient to use. Padded handles, detachable and adjustable shoulder strap. TECHAIR LAPTOP /PROJECTOR CASE ALL IN ONE. BRILLIANT IDEA/SOLUTION FOR LAPTOP AND PROJECTOR CARRIAGE. All in one solution for laptop and printer\projector. Niceday Overhead Projector with case and two spare bulbs. Condition is Used. Dispatched with Royal Mail 2nd Class. Padded Carry Bag / Case. Black heavy duty material with zipped top, internal pocket, carry handle and shoulder strap. USA Gear Portable Cinema Theater Projector Carrying Bag Rugged Design. INCLUDES CARRY STRAP - Designed with a convenient carry handle and a removable shoulder strap so you can carry your gear hands-free when traveling between your on-the-go screenings and presentations. Although its original use was for use with a projector, these would also make great laptop, notebook and tablet carry cases. We do the best research that we can and represent the item(s) as clearly and honestly as possible. Also, if required, an included internal removable Velcro divider can be used for customisable storage, so you can adapt the case to suit your individual needs. The bag is finished with a stylish black and grey design. Water-resistant Red EVA Hard Case for iOTA One limatt70(11). Colour Black. Black EVA Protective Headphone / Earphones Carry Case And Cover W/ Netter Pocket. As durable as the case is, we've ensured that it's still lightweight and ultra-portable, so you can transport your kit from location to location. A grey rugged corrugated case. Tough grey plastic handle with rugged extrusions. Water-resistant Red EVA Hard Case for iOTA One limatt70(11). Black EVA Protective Headphone / Earphones Carry Case And Cover W/ Netter Pocket. With its elegant design, the bag features a felt grey canvas exterior that is pleasant to the touch. Black EVA Protective Headphone / Earphones Carry Case And Cover W/ Netter Pocket. Aluminium Binocular Tripod for Celestron TRAILSEEKER 8X42 | SGODDE 16 x 52 kourosh8907(270). Sturdy Car Dashboard & Window Suction Mount for TomTom Start Classic Satnav. 1M Extendable Aluminium Tripod for Canon EOS 1300D, 1200D, 1100D, 750D, 700D, becwood70(202). As durable as the case is, we've ensured that it's still lightweight and ultra-portable, so you can transport your kit from location to location - whether you're skiing, surfing or skateboarding, you can grab your case and get ready to go! MPN 1578#Deeplee DP300. Water-resistant Red EVA Hard Case for iOTA One limatt70(11). Featuring a soft, padded lining. This DURAGADGET Mini Projector bag provides maximum protection for your expensive Mini Projector. 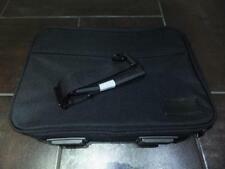 Optoma Universal Carrying Case for Projector - Black - Carrying Strap - 240 mm Height x 330 mm Width x 110 mm Depth. Manufacturer: Optoma Technology. Compatibility: Optoma - DH1008, DH1009, DH1011i, DS335, DS340, DS340e, DS341, DS343, DS344, DS345, DS346, DS346i, DW309, EH341, H100, H105, H111, H112e, H181X, H182X, HD121X, HD139X, HD141X, HD25, HD25-LV, HD25e, HD26, HD28DSE, HD30, HD421X, S310e, S312, S315, W310, W311, W312, X312. Thousands of projectors are broken each year when dropped whether during use or whilst in a case that does not provide enough protection. IntroducingDURAGADGET 's all new protective case for Digital projectors, finished in a slim black and orange design - perfect for keeping your projector close by and easily accessible. Black EVA Protective Headphone / Earphones Carry Case And Cover W/ Netter Pocket. All inserts are fully removable, including a padded pouch to keep your gadget and/or accessories scratch free. Any devices shown in our images are for display purposes only. Black EVA Protective Headphone / Earphones Carry Case And Cover W/ Netter Pocket. Cleaning Kit For Use W/ Apple Watch Series 2 | Standard | Edition | Sport. Sling Shoulder Case For Nikon D7100 D7200 D7000 D5300 D5200 D3300 D3200 D3100. Black EVA Protective Headphone / Earphones Carry Case And Cover W/ Netter Pocket. 1M Extendable Aluminium Tripod for Canon EOS 1300D, 1200D, 1100D, 750D, 700D, becwood70(202). As durable as the case is, we've ensured that it's still lightweight and ultra-portable, so you can transport your kit from location to location - whether you're skiing, surfing or skateboarding, you can grab your case and get ready to go!